Do you remember the first day when you had a video chat with your loved ones? Or the dreaded video conference with the Head Office from your local office. May be the first call was through Skype, an application popular for video calls. Just imagine if you get the same kind of privilege in a professional manner from someone like your bankers, how good and easy it would be. And that too from your ATM next door. Seems, it is going to be a reality soon. 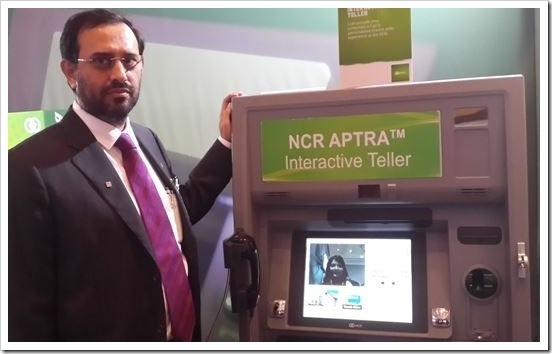 Now, account holders can look forward to videoconferencing with bank executives through ATMs with NCR Corporation India unveiling its new machine which it describes as an interactive teller. In addition to videoconferencing, the machine allows the bank executive to remotely process transactions giving most of the bank branch functionality to the ATM. 2 What’s new in the ATM? With videoconferencing, the customer would be face-to-face with a real banker who would assist in all kinds of transactions and queries. So instead of going all the way to the bank for trivial changes like your phone number, almost everything would now be possible from the ATM as it is from a bank. It would be a real boon for rural areas where ATMs are few and branches fewer. Installing such mini-branches there would serve dual purpose. With the trend started by Bank of America in New York, it is all set to rule India. What’s new in the ATM? The machine can accept currency notes of different denominations scan them for fakes and reject or impound suspect notes and identify the serial number with the depositor. It can scan identity cards and other documents, record the accountholder’s signature on a touch pad and print passbooks and issue bank statements. Banks might have to set up call centers for the ecosystem to flourish. With the huge potential waiting to be trapped, shortage of manpower would be a real challenge. Another would be availability of currency to stock in the machines. And finally, the bandwidth. For videoconferencing, a high level of bandwidth is needed, especially if the ATMs are offsite which could hamper their flourish in rural areas. Challenging, but surely not impossible. With the RBI ready to give banking licenses to many NBFCs in the coming years, they are seen as a big market for ATM manufacturers as these banks have to open several low cost branches in unbanked areas. They would surely go for these machines. Also, reigning behemoths like SBI and PNB too would lap up this opportunity to further increase their growth. With such innovations happening, may be a visit to your bank branch may soon be a thing of the past!